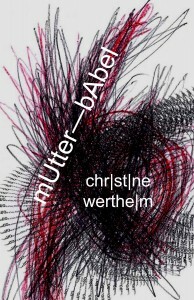 mUtter-bAbel, a graphic and textual exploration of ugly archaic feelings and their troubling social effects. It is a verbo-visual experiment integrating handmade drawings with computer-designed texts, exploring very early feelings babies have for their mothers. Whether because many people cannot remember these (at least consciously), or because they do not consider such material interesting, infantile experience has rarely been the overt subject of poetry. Christine Wertheim is a poet, critic, performer and curator, who teaches at the California Institute of the Arts. Her books include +|‘me’S-pace (Les Figues Press), Corpus, a chapbook from Triage, and the edited anthology Feminaissance (Les Figues Press). With Matias Viegener she organized an annual series of conferences on innovative writing from 2004–2010: Séance, Noulipo, Impunities, Feminaissance, Untitled, and Untilted NY. From these they edited the anthologies Séance (Make Now Press) and The n/Oulipian Analaects (Les Figues Press), a Bomb Magazine Editor’s Choice for 2008. Her poetry has been anthologized in numerous collections including Against Expression, The & Now Awards: The Best Innovative Writing, and I’ll Drown My Book. She lectures and performs internationally, most recently at the Sorbonne, Birkbeck College, London, Melbourne University, and The Echo Park Film Center, LA. With her sister Margaret she co-directs the Institute For Figuring (IFF), staging exhibitions and seminars on the intersections of art, science, mathematics and pedagogy; most recently at the Smithsonian, the Cooper-Hewitt Design Museum, The Science Gallery, Dublin, the Museum Kunst der Westku?ste, Fohr, Germany, and The New Children’s Museum, San Diego. In 2011 the sisters received the Theo Westenberger Grant for Outstanding Female Artists from the Autry National Center. In February 2012 the IFF opened a new space in downtown LA with the exhibition Physic on the Fringe, selected as a Best of LA by the LA Weekly, 2012.